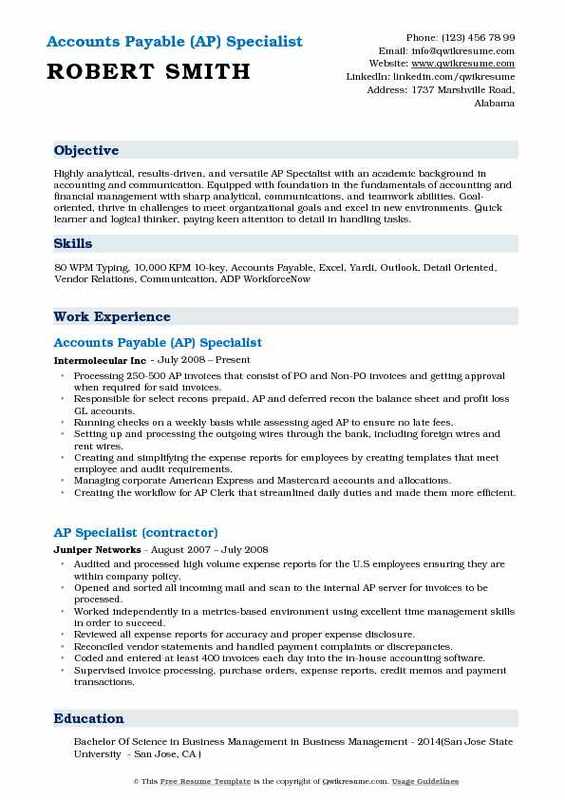 AP Specialist is a senior-level Accounts Payable professional who produces records, handle bookkeeping and financial transactions that will be required by the auditors and accountants during tax time. 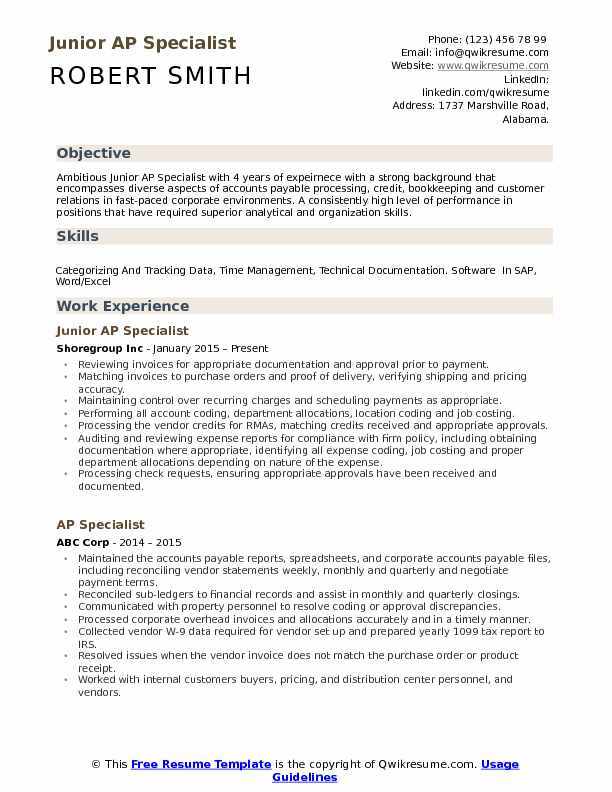 The job description and duties listed on the AP Specialist Resume include such tasks as – recording transactions and creating reports, tracking income and expenditure after checking the invoice accuracy, handling all vendor correspondence, investigating and resolving issues related to invoices, reconciling accounts, preparing non-inventory PO requisitions and assisting with monthly status reports. 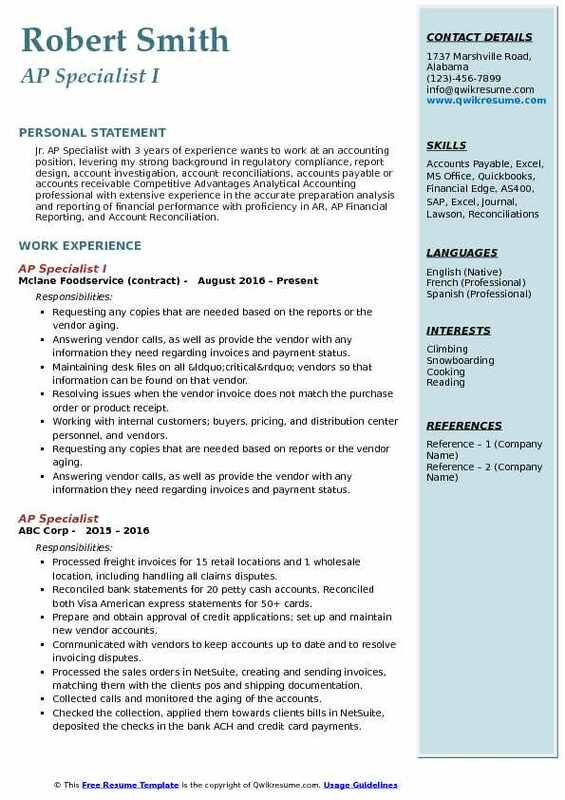 AP Specialists are required to demonstrate high-level of skill sets and education, the applicant for this role should have a strong proficiency in accounting package, have a thorough knowledge of General Accepted Accounting Principles, basic math proficiency, and discretion to maintain confidentiality. A Bachelor’s degree in Accounting or Finance along with several years of work experience is necessitated by most of the employers. Objective : Ambitious Junior AP Specialist with 4 years of expeirnece with a strong background that encompasses diverse aspects of accounts payable processing, credit, bookkeeping and customer relations in fast-paced corporate environments. A consistently high level of performance in positions that have required superior analytical and organization skills. Reviewing invoices for appropriate documentation and approval prior to payment. Matching invoices to purchase orders and proof of delivery, verifying shipping and pricing accuracy. Maintaining control over recurring charges and scheduling payments as appropriate. Performing all account coding, department allocations, location coding and job costing. Processing the vendor credits for RMAs, matching credits received and appropriate approvals. Auditing and reviewing expense reports for compliance with firm policy, including obtaining documentation where appropriate, identifying all expense coding, job costing and proper department allocations depending on nature of the expense. Processing check requests, ensuring appropriate approvals have been received and documented. Printing checks and obtaining signatures on accounts payable checks, responding to management. Summary : AP Specialist I with 14 years of expeirnece who utilizes strong organizational, time management, and communication skills towards improving department efficiency. Advanced expertise in payment transactions, corporate accounting and bookkeeping. Skilled in AP processes, month end reports, and project management. Highly regarded for balancing the needs of management, providing excellent customer service, and maintaining confidentiality. Code, enter, and post a high volume of invoices while maintain an excellent level of accuracy. Trained others for the new AP process (SAP) for accurate processing of new invoices which ensured accurate processing of new invoices and resolved the problems for difficult vendor issues. Processed weekly check run of 2.5 m and positive pay process for on-time payments of invoices. Maintained, reconciled and processed $75k employee expense reports monthly using American express reporting system; program administrator for American express business travel account. Assisted/input various month and year-end closing, including accruals, journal entries, reconciliations and purchase clearing accounts to close in a time for deadlines. Assisted Controller and CFO with multiple AP projects that clarified AP issues. Supported AR posting daily cash receipts which kept the department on schedule. Supported inventory department on vicinity batch entries so the department would continue meeting deadlines. 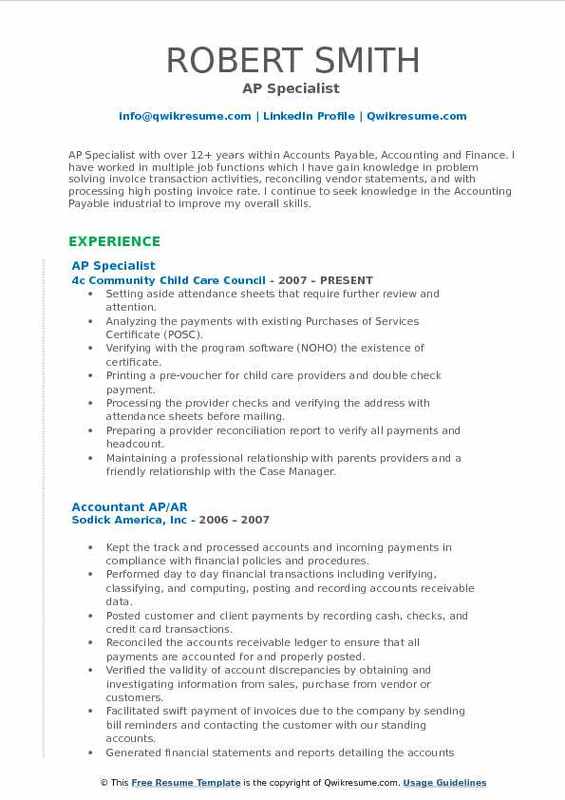 Summary : Meticulous focused AP Specialist II with 15+ years of Office Management and Accounting experience. I have hands-on data management and transaction accounting experience.Worked in Accounts Receivable and Accounts Payable as well as Auditing/Forensic Accounting Projects. Processed invoices for local and international business. Printed out and code correctly invoices that come by email or fax. Responsible for AP email inbox. Answered questions regarding past dues/collections etc. Responsibilities included matching receivers to open invoices daily. Data entry of payments into the MSM accounting system. Matched checks to processed invoices weekly and prepared for mailing. Prepared journal entries for month end closing. Prepared accrual list in excel at closing. Prepared credit and debit memos as needed. Worked with purchasing regarding invoice questions. Prepared journal entries for adjustments, month-end accruals, reconciled various accrual accounts and prepared reconciliations. Developed knowledge-base in accounting systems and participate in system testing and enhancements. Maintained the company's fixed asset records including additions, transfers, disposals, and retirements. 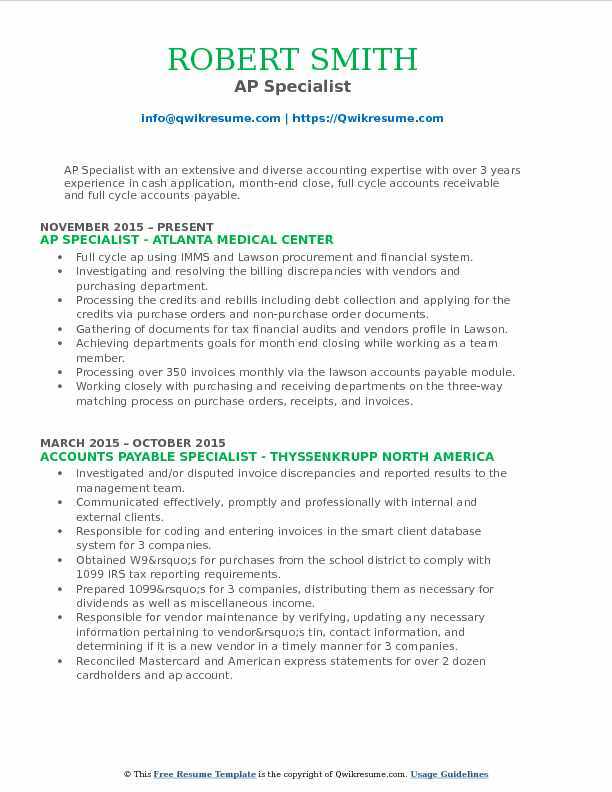 Summary : AP Specialist with over 12+ years within Accounts Payable, Accounting and Finance. I have worked in multiple job functions which I have gain knowledge in problem solving invoice transaction activities, reconciling vendor statements, and with processing high posting invoice rate. I continue to seek knowledge in the Accounting Payable industrial to improve my overall skills. Setting aside attendance sheets that require further review and attention. Analyzing the payments with existing Purchases of Services Certificate (POSC). Verifying with the program software (NOHO) the existence of certificate. Printing a pre-voucher for child care providers and double check payment. Processing the provider checks and verifying the address with attendance sheets before mailing. Preparing a provider reconciliation report to verify all payments and headcount. Maintaining a professional relationship with parents providers and a friendly relationship with the Case Manager. Summarizing and maintaining records for each parent paying fee for tax purposes. Performing a monthly peer audit in preparation for the agency-wide audit. Performing month-end AP reconciliations - purchase order, AP trade, petty cash, and postage. 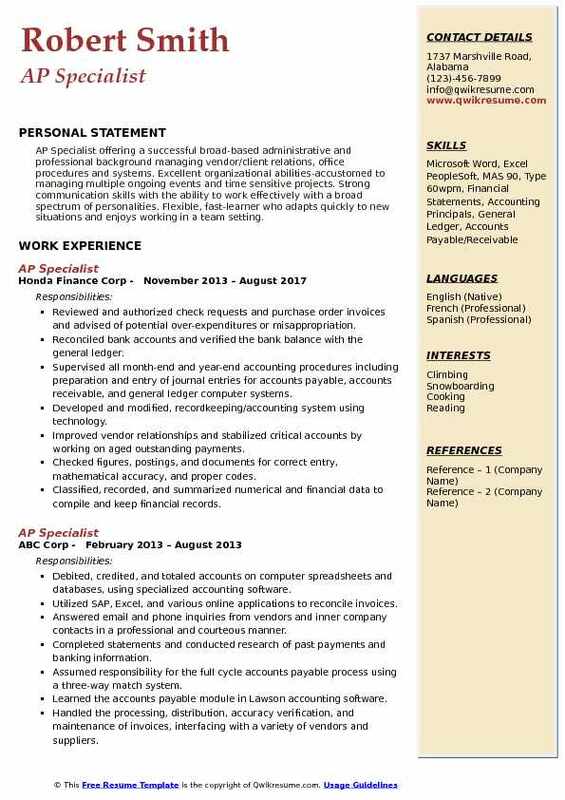 Objective : Jr. AP Specialist with 3 years of experience wants to work at an accounting position, levering my strong background in regulatory compliance, report design, account investigation, account reconciliations, accounts payable or accounts receivable Competitive Advantages Analytical Accounting professional with extensive experience in the accurate preparation analysis and reporting of financial performance with proficiency in AR, AP Financial Reporting, and Account Reconciliation. Requesting any copies that are needed based on the reports or the vendor aging. Answering vendor calls, as well as provide the vendor with any information they need regarding invoices and payment status. Maintaining desk files on all “critical” vendors so that information can be found on that vendor. Resolving issues when the vendor invoice does not match the purchase order or product receipt. Working with internal customers; buyers, pricing, and distribution center personnel, and vendors. Requesting any copies that are needed based on reports or the vendor aging. Helping to prepare actual vs budget reports for individual departments after the month-end closing. 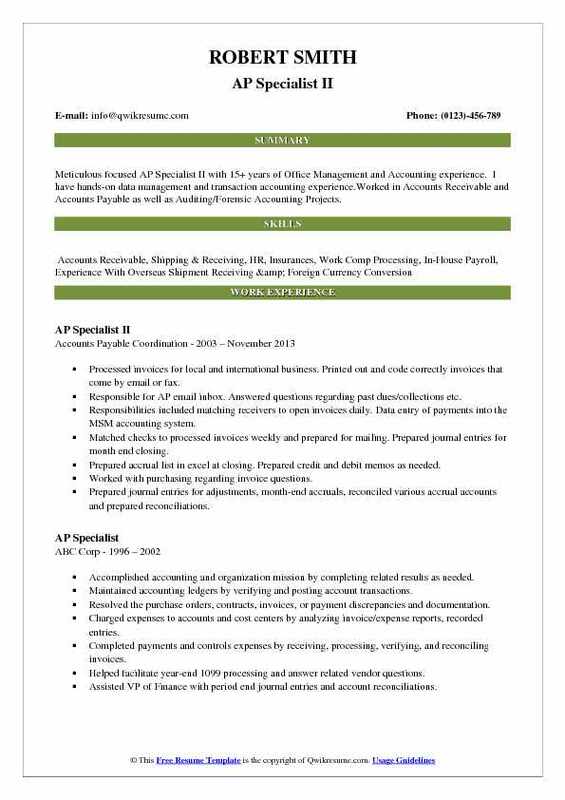 Summary : Highly analytical, results-driven, and versatile AP Specialist with an academic background in accounting and communication. Equipped with foundation in the fundamentals of accounting and financial management with sharp analytical, communications, and teamwork abilities. Goal-oriented, thrive in challenges to meet organizational goals and excel in new environments. Quick learner and logical thinker, paying keen attention to detail in handling tasks. Processing 250-500 AP invoices that consist of PO and Non-PO invoices and getting approval when required for said invoices. Responsible for select recons: prepaid, AP and deferred recon the balance sheet and profit loss GL accounts. Running checks on a weekly basis while assessing aged AP to ensure no late fees. Setting up and processing the outgoing wires through the bank, including foreign wires and rent wires. Creating and simplifying the expense reports for employees by creating templates that meet employee and audit requirements. Managing corporate American Express and Mastercard accounts and allocations. Creating the workflow for AP Clerk that streamlined daily duties and made them more efficient. Updating the monthly flux analysis on various GL accounts and investigate any discrepancies. Setting-up and maintaining all new vendors in the Solomon ERP system and verifying 1099s are filled out properly. Leading the contact for journal entries, AP, expense report and time card questions from various departments. 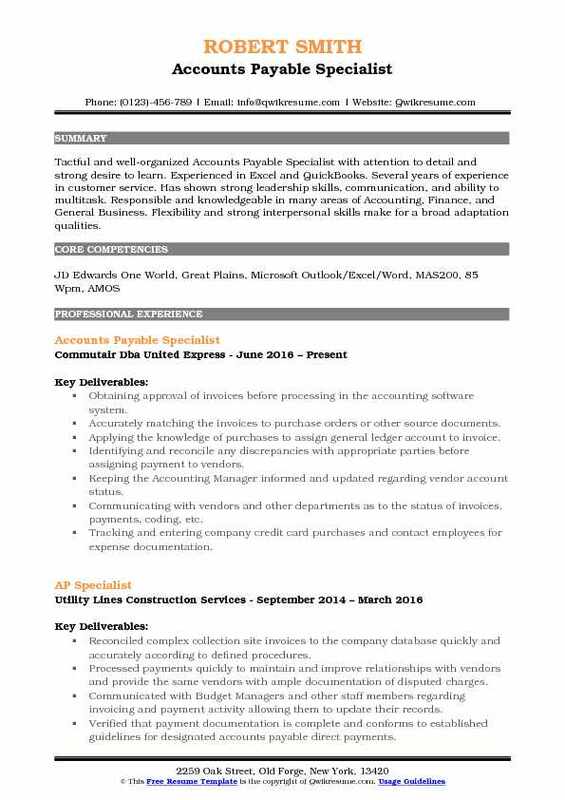 Objective : AP Specialist with an extensive and diverse accounting expertise with over 3 years experience in cash application, month-end close, full cycle accounts receivable and full cycle accounts payable. Full cycle ap using IMMS and Lawson procurement and financial system. Investigating and resolving the billing discrepancies with vendors and purchasing department. Processing the credits and rebills including debt collection and applying for the credits via purchase orders and non-purchase order documents. Gathering of documents for tax financial audits and vendors profile in Lawson. Achieving departments goals for month end closing while working as a team member. Processing over 350 invoices monthly via the lawson accounts payable module. Working closely with purchasing and receiving departments on the three-way matching process on purchase orders, receipts, and invoices. Working with purchasing department on part numbers and pricing discrepancies between the invoice and the purchase orders. Working with department directors and finance on resolving account inaccuracies. Objective : Tactful and well-organized Accounts Payable Specialist with attention to detail and strong desire to learn. 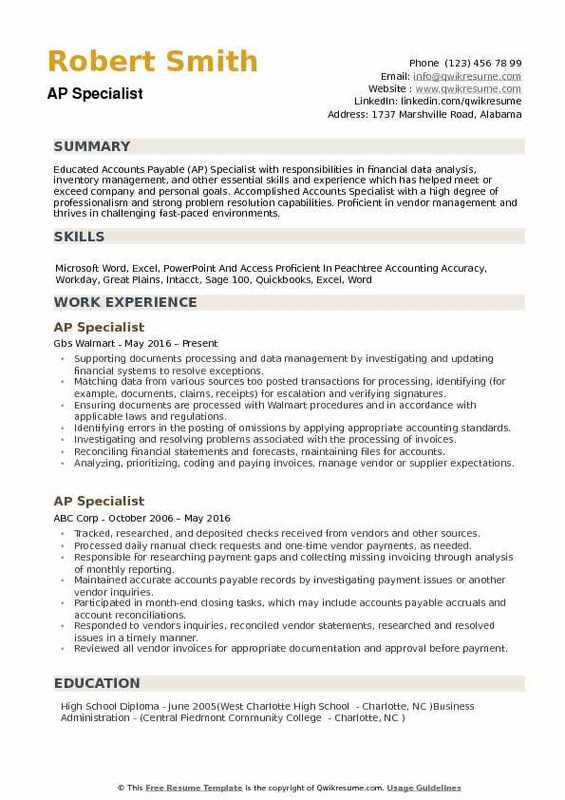 Experienced in Excel and QuickBooks. Several years of experience in customer service. Has shown strong leadership skills, communication, and ability to multitask. Responsible and knowledgeable in many areas of Accounting, Finance, and General Business. Flexibility and strong interpersonal skills make for a broad adaptation qualities. Obtaining approval of invoices before processing in the accounting software system. Accurately matching the invoices to purchase orders or other source documents. Applying the knowledge of purchases to assign general ledger account to invoice. Identifying and reconcile any discrepancies with appropriate parties before assigning payment to vendors. Keeping the Accounting Manager informed and updated regarding vendor account status. Communicating with vendors and other departments as to the status of invoices, payments, coding, etc. Tracking and entering company credit card purchases and contact employees for expense documentation. Corresponding with purchasing personnel as often as necessary to ensure payment or reconciliation issues are resolved timely and accurately. Participating in special projects and other tasks as needed for the accounting department input to the company's cash forecast. 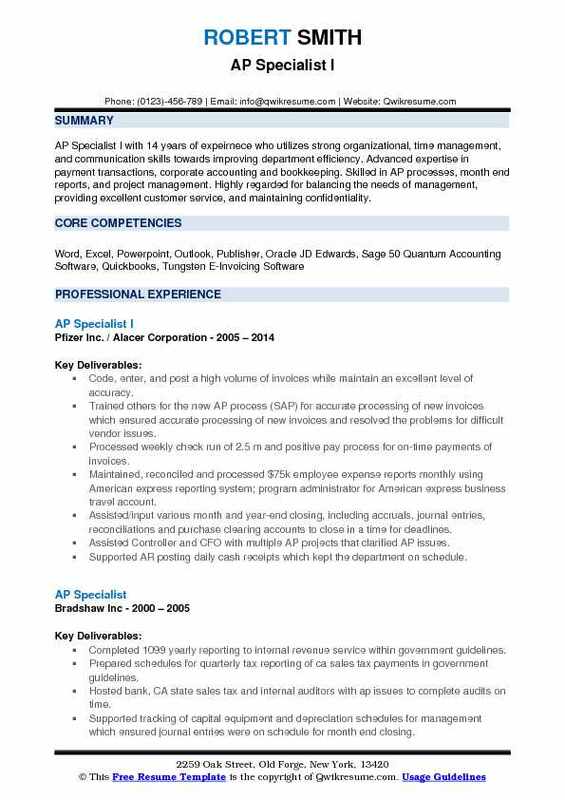 Headline : AP Specialist offering a successful broad-based administrative and professional background managing vendor/client relations, office procedures and systems. Excellent organizational abilities-accustomed to managing multiple ongoing events and time sensitive projects. Strong communication skills with the ability to work effectively with a broad spectrum of personalities. Flexible, fast-learner who adapts quickly to new situations and enjoys working in a team setting. Reviewed and authorized check requests and purchase order invoices and advised of potential over-expenditures or misappropriation. Reconciled bank accounts and verified the bank balance with the general ledger. Supervised all month-end and year-end accounting procedures including preparation and entry of journal entries for accounts payable, accounts receivable, and general ledger computer systems. Developed and modified, recordkeeping/accounting system using technology. Improved vendor relationships and stabilized critical accounts by working on aged outstanding payments. Classified, recorded, and summarized numerical and financial data to compile and keep financial records. Operated 10-key calculators and copy machines to perform calculations and produce documents. Summary : Educated Accounts Payable (AP) Specialist with responsibilities in financial data analysis, inventory management, and other essential skills and experience which has helped meet or exceed company and personal goals. Accomplished Accounts Specialist with a high degree of professionalism and strong problem resolution capabilities. Proficient in vendor management and thrives in challenging fast-paced environments. Supporting documents processing and data management by investigating and updating financial systems to resolve exceptions. Matching data from various sources too posted transactions for processing, identifying (for example, documents, claims, receipts) for escalation and verifying signatures. Ensuring documents are processed with Walmart procedures and in accordance with applicable laws and regulations. Identifying errors in the posting of omissions by applying appropriate accounting standards. Investigating and resolving problems associated with the processing of invoices. Reconciling financial statements and forecasts, maintaining files for accounts. Analyzing, prioritizing, coding and paying invoices, manage vendor or supplier expectations. Validating and recording transaction to subsidiary ledgers enters journals entries to affect financial statements. Interpreting and posting information, allocating income or expense when processing documents.